Mamata Banerjee today announced that she would hold a state cabinet meeting in Darjeeling a day after she had been heard toying with the idea after being mesmerised with the serenity of Raj Bhavan here. Attending the 202nd birth anniversary of Nepali poet Bhanu Bhakta at Chowrasta here today, the chief minister said: "We will hold a cabinet meeting in Darjeeling." 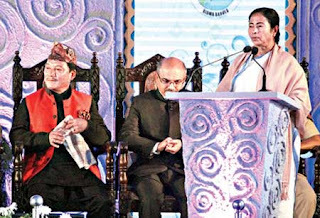 Yesterday, while waiting to receive President Pranab Mukherjee at Raj Bhavan in Darjeeling, Mamata was heard telling chief secretary Basudeb Banerjee and other officials: "This is such a beautiful place. We must hold a meeting of the cabinet here once." Government officials in Calcutta said they did not know of another instance in recent times when a cabinet meeting was held anywhere outside Calcutta or Nabanna. Asked how much it would cost the state to transport ministers to Darjeeling, some officials said it would be tough to tell as how this would be conducted was not clear yet. Holding a cabinet meeting in Darjeeling would not be impossible but given the diversion of traffic during the visit of VIPs and lack of parking facilities in town, local people believe they would face a harrowing time. "Imagine all cabinet ministers and officials moving around at one time. It would be a logistical nightmare for the organisers as well as the residents. For the past two three days, the serenity of Chowrasta has been destroyed by this huge ugly pandal and police leave absolutely no room for people to walk around at the square," said a Darjeeling resident, who didn't want to be named. The pandal had been erected at Chowrasta for today's Bhanu Bhakta's birth anniversary celebration and to host a reception for President Pranab Mukherjee yesterday. Before making public her cabinet meeting plans, Mamata today announced the formation of development boards for Kami, Dami and Sarki, which are Nepali scheduled castes. "When I come to the hills, there are demands for development boards. People say they should also be given a chance to develop. We will form three development boards for Kamis, Damis and Sarkis," said Mamata. The total number of development boards in the hills now stands at 10 with today's announcement. Mamata was heard telling chief secretary Basudeb Banerjee and other officials: "This is such a beautiful place. We must hold a meeting of the cabinet here once."